If you’re looking to improve your health, try playing less, sleeping more and abandoning those useless warm-ups that do little to prepare you for volleyball. I often hear people blame their injuries on a poor warm-up. They say, “I probably didn’t warm up enough – or correctly,” whatever that means. I disagree. Most warms-ups I see are a waste of time. They lack mindfulness and are poor preparation for the activities that lie ahead. Nearly every athlete is disinterested in the warm-up. This includes players on collegiate and professional teams in all sports, not just youth volleyball. Disinterest in warm-ups isn’t the fault of the athlete or staff. It’s a cultural problem. Collectively, humans move so poorly that the idea of a “warm-up” had to be created. We are the only animal that “warms up” before activity. A lion does not prepare for a hunt with 30 minutes of glute activation. To my knowledge, there isn’t an animal kingdom ACL tear epidemic going on due to the lack of proper warm-ups. Sport is a problem-solving activity in which movements are used to produce the necessary solutions. Keep the ball off of the ground. Make the ball hit the ground on the other side of the net. Again, non-contact injuries are a result of a history of movement dysfunction. Now, some people might be saying, “What about activating my glutes/hips/core/muscular pattern? !” Well, the reason you have to “activate” a body part is because you don’t use it in activity. Ten to 20 minutes of activation will not last through 2 hours of intense volleyball. Whatever activation you have created will diminish minute by minute afterward. The issue is how you are moving. We move to perceive, and we perceive to move. Volleyball is a skill of perceiving an opponent and ball trajectory in order to keep the ball off the ground, then putting it on the ground over the net. Unless you are changing your movements with the correct perception involved, your “activation series” will do very little to help you throughout practice or a game. A mindless activation series is not enough of a physical stimulus to dictate a change in the athlete. A change would require lots more work. I don’t want to spend much time on weightlifting, so the road we take will be short. I hear many people express concerns that weightlifting causes injuries. Some coaches say not to lift, some coaches swear by it. The weight itself is innocent and does nothing to create benefit or harm. Moving poorly with weight causes lots of harm. Moving the weight with high quality may cause lots of benefits. To put things in perspective, the force from landing after a jump is anywhere from 7-12 times the body weight of the athlete, depending on what source you look at. Regardless of the exact number, the point is the same. A 150-pound athlete experiences 1,050 to 1,800 pounds of force upon landing. And they do this anywhere from 50-300 times during their sport! Sport is much more strenuous on the body than lifting. Moving poorly while playing your sport is extremely costly. The fact that there aren’t MORE injuries is a testament to how robust the human body is. Even if the athlete moves extremely well and has high quality training outside of volleyball, the athletic path still has many dangerous turns. I was working with a volleyball athlete who was one of my best movers. One day, she landed on an opponent who had come under the net, which resulted in her ACL tearing. Months after returning to the sport, she had a string of 3-day tournaments, back to back to back. This was 9 days of competing, in addition to practice, within a 21-day period. The amount of jumping she did during this month was far beyond her capabilities. As she progressed throughout this 3-week period, her bandwidth for safe movement slowly diminished. In the last game of the last day of the last tournament she re-tore her ACL in a non-contact jump. This happened as a result of not having enough rest paired with her work. As a middle blocker, she was jumping 2 to 3 times more than her teammates. I thought endlessly about how we could have prepared better, or prevented this injury. The only answer I came up with was to lighten her playing schedule. Hardly any athletes are prepared for that kind of work load, and no athlete should have to prepare for such a workload. I hear stories of teams playing way more than needed. I hear of teams playing each other several times in a weekend, with the outcome never a surprise. Volleyball associations across America could do a much better job in how they schedule tournaments. One of my volleyball athletes recently played until midnight! No kid needs to be playing until midnight! Are you kidding me? They need to sleep! In a research article title “Chronic lack of sleep is associated with increased sports injuries in adolescent athletes,” the authors showed that “hours of sleep per night and the grade in school were the best independent predictors of injury. Athletes who slept on average less than 8 hours per night were 1.7 times more likely to have had an injury compared with athletes who slept for 8 hours or more. Due to various American cultural athletic expectations, athletes will typically choose to play in a midnight game. This ridiculous opportunity to play until midnight should not exist so they don’t have to make such a choice. Maybe if the associations put themselves in the kids’ shoes from time to time, they would reevaluate how they organize tournaments. I have an entire article dedicated to practicing what you preach and putting yourself in other people’s shoes. I would love it if parents and coaches felt more comfortable with not having their athletes play in every tournament. An even better situation would be if kids understood the importance of sleep and rest and prioritized it over unnecessary competitions. There is no corrective exercise for being unaware. Asking good questions and building awareness is a meta skill that transfers far beyond the realm of sport. A friend and prominent trainer in the sporting world recently told me that when he assesses athletic readiness, nature typically has something that is better than any technology. One of his favorite measurements is mood. His assessment tool is simply the question “How do you feel?” If you feel terrible and don’t want to play in a tournament, maybe you should not play. It isn’t laziness or quitting. It is listening to what your body is telling you to do. Rest is part of getting better. Remember, when you work out, practice, or compete, you are actually getting worse. Your muscle is breaking down, and your brain is fatiguing. It’s when you sleep and rest that you actually get better. You eat well, so you have better building blocks to recover from these stresses. Sometimes the best prehabilitation is not doing any work at all. Rather, going for a long walk, playing another sport – or even video games – are better options. Yes, parents, video games. In moderation, of course. From a certain point of view, injuries are quite simple. Listen to your body. Ask questions to yourself, teammates, coaches and athletes alike. How does this feel? How do my knees feel? How do I feel? Could I do this with less effort? Am I balanced? Do I have weight on my whole foot? Exactly when does my knee hurt and what is happening then? Question your coaches and trainers. Why are we doing this skill this way? What does this do for me? Remember, more work is not always the answer. The best athletes in the world move gracefully, and they do so for an entire career because they are efficient. They move with ease on the court and recover better than others off the court. So when you are in your defensive position and have your arms straight out like they are made of wooden poles, is that the easiest way to hold your arms in preparation to move? 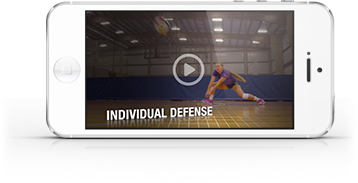 Are you balanced when you’re “on your toes” on defense? Could you push someone over from being on your toes? What about the stiffness in your shoulder and arm as you yank your elbow back into “bow-and-arrow” position? Questions help connect the body to the mind and bridge the gap from perception to reality. Energy and movement must not be wasted. Being aware of how you move is not restricted to sport and training. It is a lifestyle. Check out Part 1 of this article!